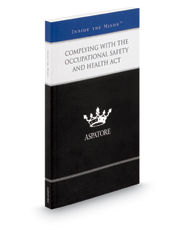 Complying with the Occupational Safety and Health Act provides an authoritative, insider's perspective on key tips for helping clients avoid, address, or appeal OSHA violations. Featuring experienced partners from law firms across the nation, the book guides the reader through the process of properly training employees, keeping adequate records, and handling investigations if they arise. These top lawyers offer specific advice on working with compliance officers, conducting audits, and staying informed about OSHA developments. From implementing proper safety programs to understanding key requirements, these experts discuss the importance of educating clients on eliminating workplace hazards and the significance of OSHA-related penalties for noncompliance. The different niches represented and the breadth of perspectives presented enable readers to get inside some of the great legal minds of today, as these experienced lawyers offer up their thoughts on the keys to success within this predominant field.